Look for seashells or build a sandcastle with the kids. Go for a swim or grab a lounge chair and relax. 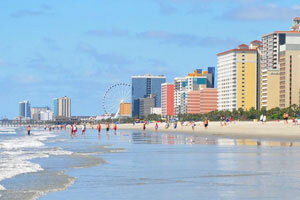 The resort offers direct access to Myrtle Beach. Kids will love the seasonal activities and the foosball table at the resort. The indoor heated pool is perfect for enjoying a swim on cooler days. The beachfront Jade Tree Cove is located in a quieter area of Myrtle Beach, but close enough to access the area’s best attractions. Spend the day at the beach, go for a family walk along the sand and search for seashells with the kids. Or relax in a lounge chair while the little ones show off their sandcastle building skills. Be sure to snap some pics to share on social media when you get home. When you’ve had enough of the sand, go for a swim at the resort’s outdoor pool or, if it’s not too crowded, play a game of Marco Polo. When it’s time for lunch, recruit the kids to help carry burgers, condiments, and cheese to the BBQ grills for a cookout. Choose a picnic table, lay everything out, and let the burger assembly line begin. After lunch, take advantage of Jade Tree Cove’s access to the amenities at nearby Sand Dunes Resort. The kids won’t be able to get enough of the water park and lazy river. If the weather isn’t cooperating, check out the indoor pool and hot tub. Before heading back to Jade Tree Cove, get a quick workout in at the fitness center. Studio condos sleep four guests; upgrade to a studio with den for more space and the ability to sleep up to six guests. One- to three-bedroom condos sleep six guests. Stop by the Food Lion grocery store to stock your full kitchen with the essentials; and maybe some not-so-essentials (you are on vacation, after all). Bake up a batch or two of your famous brownies and let your junior bakers assist. When the kids inevitably end up covered in chocolate, don’t panic! The resort has an on-site laundry facility. Enjoy the brownies while you watch a rerun of The Big Bang Theory on the flat screen TV with cable. DVD players are perfect for a family movie night. Bring movies from home, or check out the selection of DVDs available for rent at the resort. Gather everyone on the couch, put one of the kids in charge of snacks and another in charge of picking out the first movie. All condos are air-conditioned and have private balconies that overlook the Atlantic Ocean. Golfers will appreciate the resort’s proximity to the Dunes Golf and Beach Club; it’s just a short drive from Jade Tree Cove. This eighteen-hole, Robert Trent Jones-designed course opened in 1949 and was completely renovated by Robert’s son Reese in 2013. Dunes Golf and Beach Club co-hosted the 2014 PGA Professional National Championship. Broadway at the Beach features a variety of shopping and dining options. Did you forget to pack your sunglasses? No problem! Pick up a new pair at one of the three Sunglass Hut locations. Little ones will enjoy creating their own stuffed animal at Build a Bear. Browse the gifts and collectibles at The Mole Hole, or check out the selection of jewelry from Brighton, Pandora or Spartina. Create your own piece of jewelry at Pick a Pearl. Pick out a gift for your four-legged family member back home from Reigning Cats & Dogs. Hungry? Dine at Joe’s Crab Shack, Johnny Rockets or Señor Frogs. The Children’s Museum of South Carolina features several interactive exhibits that allow children to use their imaginations while learning at the same time (but don’t tell them that!) They can pretend to be a paleontologist and learn about dinosaurs at the South Carolina Fossil House. They can be a weather person or a newscaster at the Weather Center and Continuous News Desk. They can learn about money by pretending to be a customer or bank teller at The Big Bank. - Guests that are planning to arrive after 5:00 PM must contact the property in advance using the information on the booking confirmation. Guests that are planning to arrive on Sundays must contact this property in advance for check-in instructions and key retrieval information. Please contact the office using the information on the reservation confirmation received after booking. Kids stay free! Children 10 years old and younger stay free when using existing bedding.